The Hutchinson Fusion 5 Performance Tubeless Tire is designed for long-lasting performance in all weather conditions. Featuring Hutchinson's ElevenSTORM® exclusive rubber compound, this performance-oriented compound delivers outstanding rolling performance, grip, durability, and comfort all in one. Go faster, farther with the Fusion 5 Performance leading the way, using a Kevlar® reinforcement under the tread ensures these tires will keep spinning well beyond the competition. 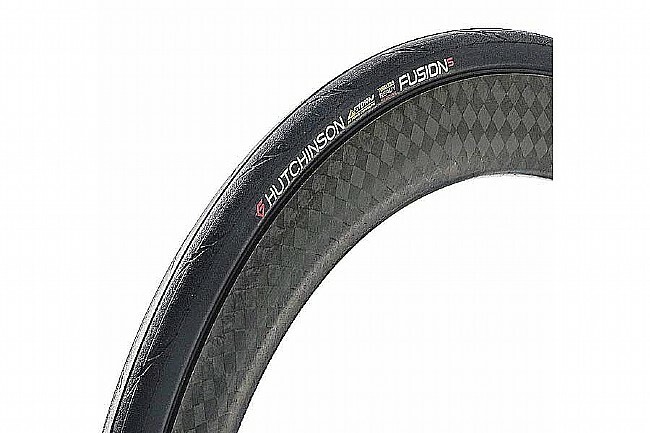 The Hutchinson Fusion 5 Performance 11Storm tire is tubeless ready. Available in two widths: 25mm or 28mm. Claimed weight: 255g (25mm). I've been a Hutchison tubeless fan for quite some time! In my humble opinion, tubeless is the only way to fly, and not just for mountain bike wheels. Yes, it can be a little more difficult to install a road tubeless tire with the stiff bead, and pumping them up requires finesse. But....it is so worth it. A smooth ride and virtually no flat tires (knock on wood that I did not just jinx things). I used the Fusion 3 for several years and now the Hutchison Fusion 5. I cannot recommend them enough, and I will keep buying them. I generally ride the 28's, as I have grown to enjoy the comfort. I don't understand why more roadies don't ride tubeless, but to each his own. All I know is I am happy with these tires. Easy to mount tubeless. I bought 2 of these and both had to be replaced within 150 miles because of bubbles developing in the outer casing. BD exchanged them quickly without any problems. I also experienced a lot of punctures-all sealed with sealant-but it punctures easily. They have a very comfortable ride, as close to a latex tubed clincher as I've experienced with a tubeless, and quite grippy. (I've ridden just about every tubeless road tire on the market for over 10 years of tubeless road riding). I won't be buying these again. Just purchased a 2019 loaded Venge and put these tires on ! Tubeless way to go !! Light , fast, and tubeless ! This is a very fast tire and handles nice as well. I have about 1000 miles on my first pair . The 700 x 25 mm version measure 27.3 mm on my Zipp 303 NSW rim brake wheels that have an inner bead to bead width of 19mm. They mount with no tools and inflate with a hand pump, you need to sponge soapy water on the bead to make it easy to snap into the rim bead seat. ( this is on my Zipp 303 NSWs ). I have weighed 3 of these at 238 - 245 grams . Hutchinson have finally got a tire that competes on all levels with the best tubed clincher Tires. These were much easier to install than previous Fusion tubeless tires (looking at you Fusion 3) and comparable to other modern tubeless ready models. They have been durable and resistant to cuts and punctures (Utah roads are notorious) and have a nice supple smooth rolling feel similar to the Schwalbe One Pro that many of us like the ride but give up because of innumerable hard to seal punctures. I have put them on my road bikes as well as my wife's bike.